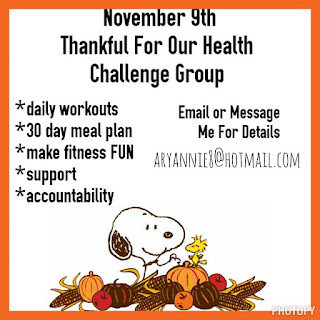 This month, I’m launching an exclusive group for this new nutrition program and I’m super excited for it! 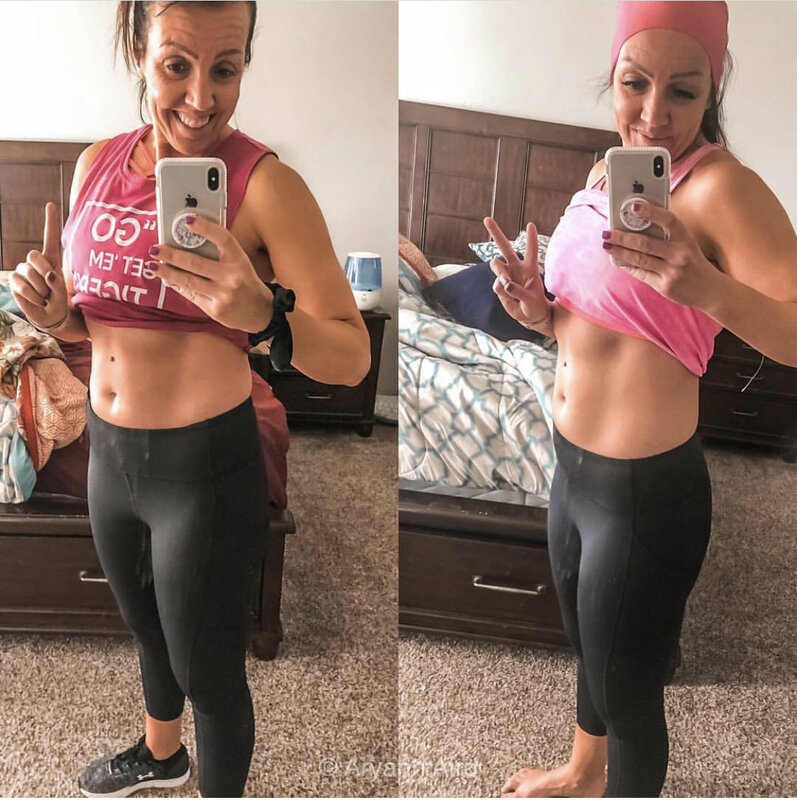 For this group ONLY we also get direct access to work out from home with the Supertrainer and Program's Creator Autumn she releases out ALL NEW WORKOUTS for 21 Day Fix and Fix Extreme! These will be streamed live each day starting on April 1st! MACROS - Do you find them overwhelming?! This new nutrition program is based around the portion controlled container system that you may already own (collecting dust) or have seen and thought of them as cute food storage. But after 5 years since those launched, there is so much more we need to learn and understand about nutrition to create long term results. In case you aren’t familiar with it, this is a system that tracks and counts macros for you - SIMPLIFYING the clean eating process! Fill a green container - that’s one veggie. Fill a purple - those are your fruits. And the yellow container: healthy carbs. YES! You can actually eat bread and still get results! And don't worry, you get a LOT MORE than just one per color! Most people actually feel they can't eat all the food they're allotted, which is determined by where you are now and what you goals are. It’s not about just eating less - it’s about eating what’s best and the right amounts of foods to fuel your body for your goals! This system takes the guesswork out and will work for anyone!!! And because I believe in it so much, that if you don’t get results, you can get a full refund within 30 days of using the products! You literally have nothing to lose, except a few pant sizes!!! If you're ready to get yourself into some new Summer Clothes, click the link below to get all the details and apply to join us!! We start Prep on Monday, March 25th!! P.S. : I mean have you seen these Progress Pics?! This can be YOU! For me, having my favorite go-to recipes handy along with finding awesome new ones is vital to meal planning!! Are you always on the lookout for new healthy recipes? Are you a recipe hoarder like I am? How do you save your recipes? 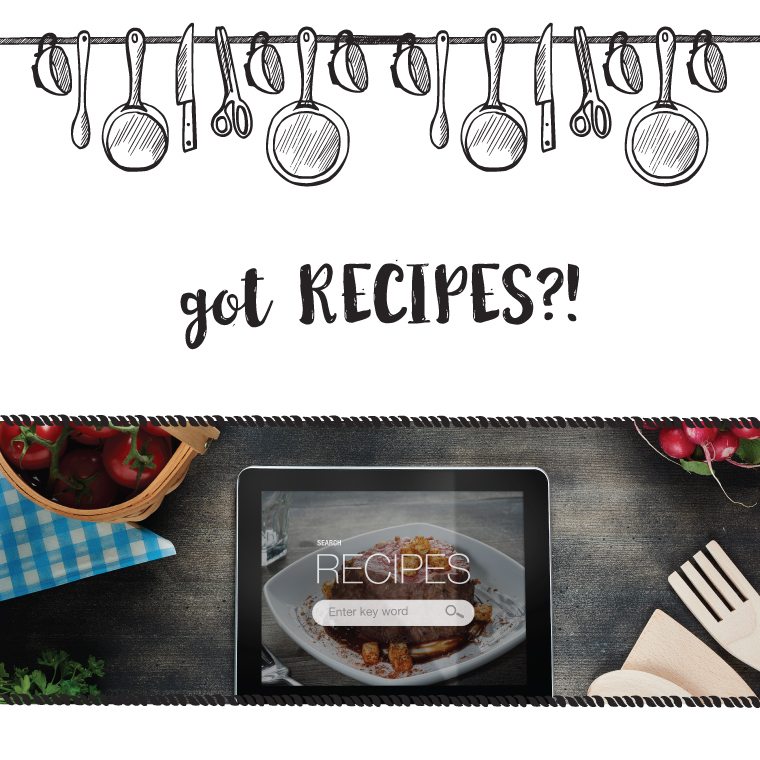 Other ways to save your recipes would be: by pinning from websites onto your pinterest (but make sure to go back and look at them! ), use a recipe saver app, save them to a folder on your computer, print out and put in a binder with category dividers (soups, salads, mexican, smoothies...), etc. What are some of your favorite websites or cookbooks to find recipes? Here are mine below! Check them out and make note! Place the steam basket at the bottom of your Instant Pot. Add cauliflower florets and 2 cups of water. Set IP to 3 minutes on manual setting. After cook time is through, carefully set to quick release and wait for steam to stop before opening the lid. Drain the cauliflower and puree in a food processor with 1/2 cup of the chicken broth. Measure out 2 cups of the puree for the Mac and Cheese. Freeze extra puree to use later. Add pasta, 2 cups of broth, garlic powder, butter, salt, and dry mustard into the IP. Set to manual for 2 minutes. After cook time is through, place a kitchen towel over the steam vent and switch to quick release. Wait for the steam to stop before opening the lid. Stir cheese and 2 cups of cauliflower puree into the pasta and mix well. Serve immediately! Here we GO guys!! Let's get started! So what is "meal planning" anyways? 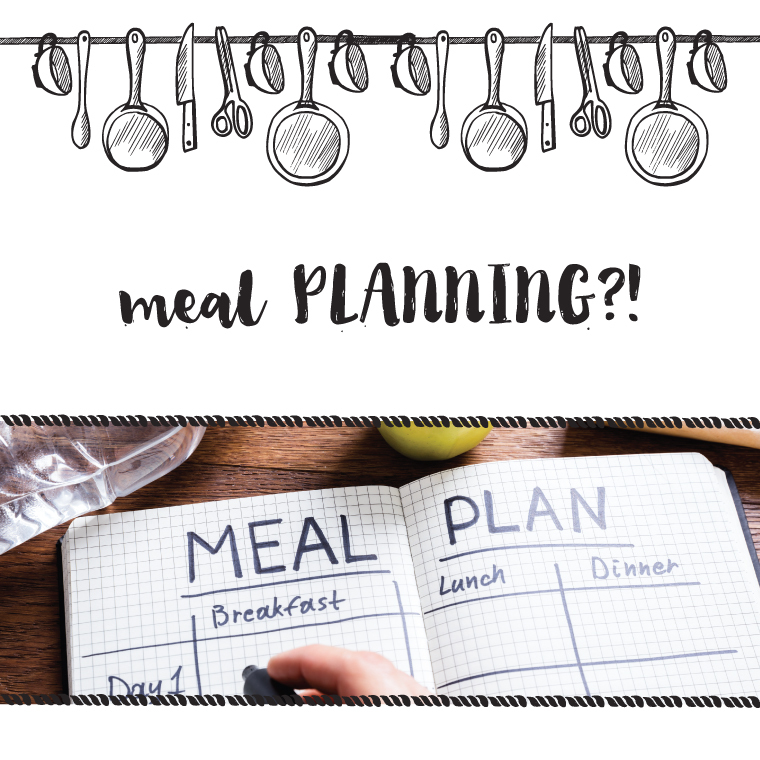 To kick things off, I just want to share what "meal planning" means to me! 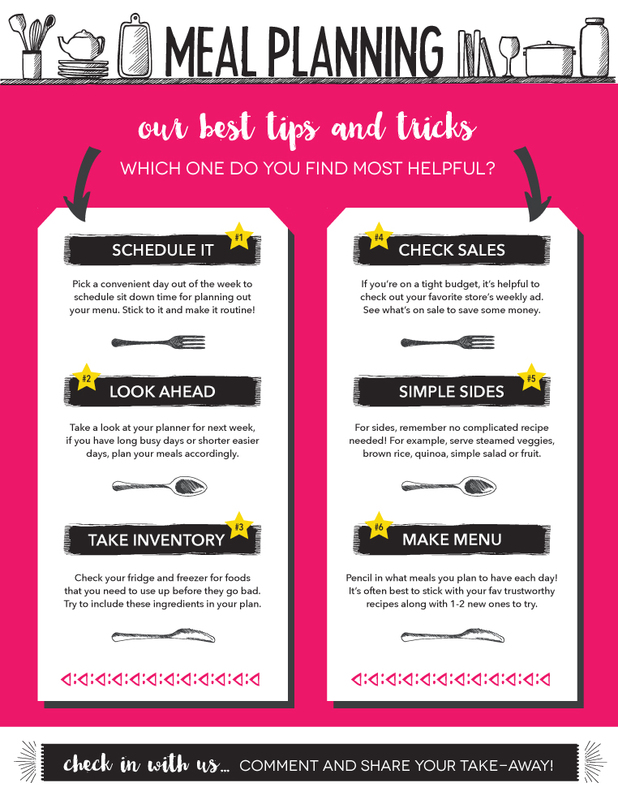 Simply put, meal planning is the MENU you make before you grocery shop! Most people only meal plan for a week at a time... sitting down once a week to plan the next week's menu. Some people may plan a month in advance, freezing neatly-labeled packets of soup and stew. Meal planning is a really personal thing. What works for you may not work for me. 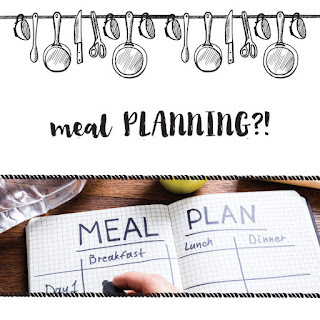 Why do we all get on board with this meal planning nonsense? Is it a fad? I don't think so! I've been at it for over two years now and it is a staple part of my week - EVERY week. The benefits truly are endless and taking an hour or two out of your weekend to plan and prep takes the guess work out of eating healthy. When it's Wednesday and 5 pm and you're EXHAUSTED - guess what? Your dinner is already planned and prepped. And it's good for you! No more pizza bloat mid week because you're too tired to "figure out what's for dinner." Trust me - I am the WORST when it comes to the mid week woes and lack of motivation. This is why planning is so important to my fitness success! One of the BIGGEST benefits of meal planning - it saves buckets of money! The biggest complaint about healthy eating I hear - "clean eating is too expensive." DUH, friends, so is eating out multiple times a week! Do you have kids? A trip to McDonald's costs over $25 for my family. I can make a health filled dinner at home for MUCH cheaper than that. It's truly a no brainer. Once you get into a routine and have your staples in your pantry, you'll be surprised at how much you can save by eating at home. The best way to do that is when you go to the grocery store, have a list and STICK TO IT! 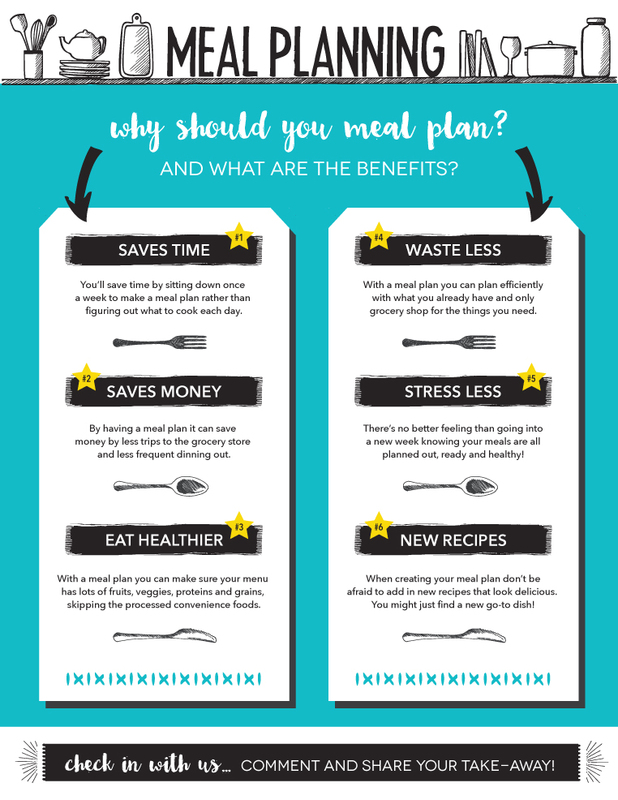 Also, meal planning helps us to eat healthy! That's kinda the point, ya?? It removes the daily stress of 'what's for dinner'?? Seriously nothing feels better than having it all planned, prepped, and ready to go! Additionally, we all have fun trying new recipes, right? I try at least one new recipe per week - if my family enjoys it, I add it to my recipe book and it's a keeper! Adding variety to our routine keeps things interesting and exciting for us! --> What's your main takeaway for today? What are you most excited about? about meal planning, and help on how to execute it successfully! 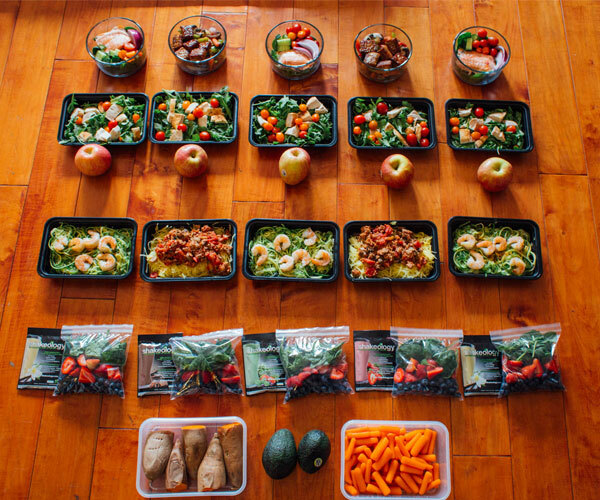 #1 :: Schedule a consistent time for meal planning. This can be anytime that works best for each individual. Try to keep it similar each week - routine is easier to keep that way! For me personally, I grocery shop on Saturdays so I plan my menu for the following week each Friday. No. Matter. What. I never go to the store without a list. I plan for one week in advance. Two weeks can be very overwhelming, especially for beginners. If you eat a lot of fresh produce, it will likely not keep for two weeks. 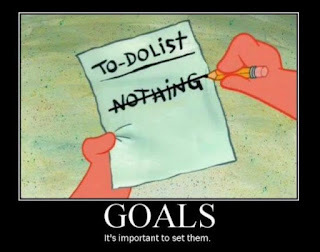 #2 :: Look at your planner! What's next week look like? What activities are scheduled for your kiddos? If you have soccer practice on Thursday, maybe plan a simple crock pot meal for dinner so it's quick and easy! Being busy does not mean you have to eat out. #3 :: Inventory your kitchen. THIS IS NUMBER ONE FOR ME. It saves money and keeps me from purchasing unnecessary groceries that will spoil and go to waste. Nothing irks me more than throwing away perfectly good food because we didn't eat it fast enough. The main things you can inventory - protein sources, veggies, and your pantry. Plan your meals around what you already have at home to keep your grocery bill low as possible. #4 :: Check out the sales (and coupons)!! I love looking through the weekly ad or circulars from my favorite grocery stores. Most even have apps now to digitally "clip" coupons. Nothing like saving money, right?! Do you see fresh organic tomatoes and your favorite pasta on a flash sale? It might be a good idea to pencil in a healthy spaghetti night the following week. But for real, wherever I can find the cheapest avocados, organic berries, bulk staples or frozen veggies, that's where I'll head! #5 :: Keep side dishes simple. There's no need to do double the cooking. Brown rice, quinoa, veggies, healthy pasta salad - all make great healthy sides that take minimal effort. #6 :: Choose your meals. 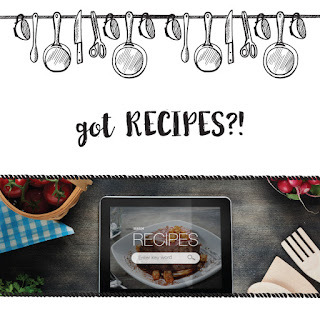 Add in your tried and true recipes, maybe a few new ones, don't overcomplicate things and plan for leftovers! Once my menu is planned, it goes on the fridge. Right after this, compile a grocery list based off your recipes and menu. View the recipes and check what you already have at home. (This will likely include spices and pantry staples - leave them off your list to save money!) Stick to your list once at the store! --I hope this helps! What is your main takeaway? Which tip will be most helpful for you? You’ve been asking for it and HERE it is!!!! I’m hosting an AMAZING 6 DAY Meal Planning & Meal Prepping WORKSHOP!! Planning my menu and prepping my meals for the week has helped TREMENDOUSLY to keep me on track and set myself up for a successful healthy week! I cannot stress enough how important this positive habit is! 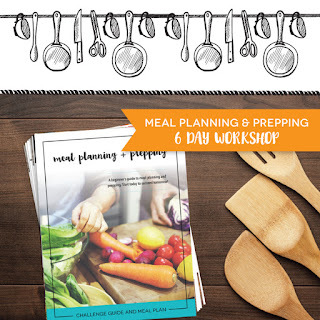 Are you wanting to learn more about meal planning? Don’t know where to start? Just feel overwhelmed with the entire process? Needs some motivation and tips to get you started? Ideas on where to look for recipes? 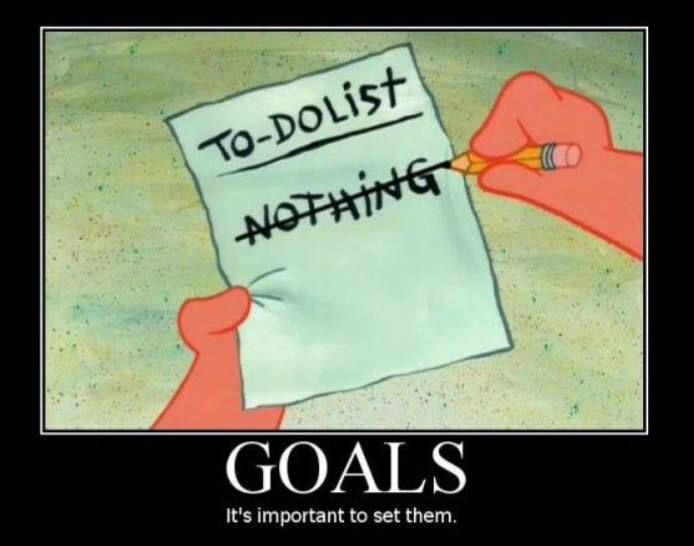 Accountability to get you going? I will also be doing a live Q&A at the end to help answers all your questions and address your biggest struggles when it comes to planning and prepping. I AM here for YOU. PLEASE JOIN ME!! I’m super excited to HELP teach you what I’ve learned in hopes that it’ll make this journey much easier for you! 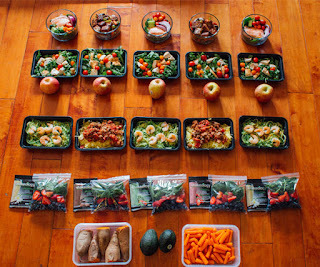 Are you ready to take control of your health and incorporate food prep into the mix? Comment below if YOU ARE IN! I absolutely cannot wait! If you are like me you would love to hire someone to meal prep for you. I don't mind laundry or cleaning. Meal prepping is not my fav, but it is what saves me everyday on a crunch time schedule. It is worth all the grumbling and whining I do. Click here for some tips.